President Obama complained Tuesday about opposition scare tactics against a proposed health care overhaul but said that failing to fix problems in the current system would be the scariest outcome of all. In a new twist at such forums, Obama specifically asked for questions from opponents of health care legislation to address issues of concern. He repeated guarantees that a health care overhaul won’t force anyone to give up health insurance they like and won’t cut Medicare benefits, and he stood by his election pledge that he won’t raise taxes on people making less than $250,000 a year. At the same time, Obama defended his call for a government-funded public health insurance option to compete against private insurers. He said such an option would hold down rates, rejecting accusations that it amounted to a government takeover of health care because private companies can’t compete with a government-funded plan. “UPS and FedEx are doing just fine,” Obama said, referring to private courier services that compete with the U.S. Postal Service. “It’s the Post Office that’s always having problems.” Specter also faced a noisy crowd at a second event later in the day in Lewisburg, and McCaskill heard similar conservative arguments at her meeting in Hillsboro, Missouri, outside St. Louis. Watch a voter tell Specter, “Leave us alone” » McCaskill kept the meeting running despite frequent shouts and booing, though a short scuffle in the crowd interrupted her. “Take a deep breath and sit down,” she told the crowd as security officers removed one woman. “I want everyone to remember we had prayers at the beginning.” Like Obama, she rejected claims by audience members that health care legislation would force people into a government-run public health insurance option, saying, “We’re not going to force anybody. It’s called an option for a reason.” McCaskill also noted that many of those opposing the public option like their coverage by Medicare, “a government-run program.” Videos of other protests circulating on the Internet show raucous crowds heckling their representatives in Congress and carrying posters with devil horns drawn on lawmakers’ heads, swastikas, or Obama with Adolf Hitler’s mustache drawn on his face. iReport.com: Attending a town hall The White House has launched what it calls a Health Insurance Reform Reality Check Web site designed to combat what the administration considers misinformation about the issue. 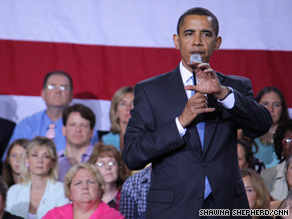 The Web page features Obama aides discussing various aspects of health-care reform. Watch more on the battle facing Obama » However, the Web site prompted Republican complaints that Obama’s government would use it to compile a list of enemies. Obama rejected that accusation, too. He called a health care overhaul essential for ensuring long-term economic stability while ensuring that that virtually all Americans have access to health insurance. “The status quo is not working for you,” Obama said, to applause. Congressional action on a health care overhaul has slowed because of strong Republican opposition. Neither chamber met Obama’s goal of passing a bill before their August recess. In particular, Republicans and some Democrats reject the proposed public option, which they believe will lead to a government takeover of the health care system and prove too costly.